EVERETT, Wash., Sept. 29, 2014 -- Boeing [NYSE: BA] and Air China today celebrated the delivery of the airline's first 747-8 Intercontinental. Air China is the first carrier in Asia to operate the passenger version of the new, fuel-efficient 747-8. Pictured here is the first of seven 747-8 Intercontinentals that will eventually deliver to Air China. 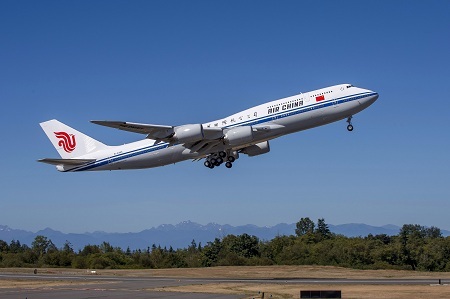 EVERETT, Wash., Sept. 29, 2014 /PRNewswire/ -- Boeing [NYSE: BA] and Air China today celebrated the delivery of the airline's first 747-8 Intercontinental. Air China is the first carrier in Asia to operate the passenger version of the new, fuel-efficient 747-8. The new airplane is the first of seven 747-8 Intercontinentals Air China has on order.